I know this may sound crazy, but chocolate chip cookies are overrated. While I do enjoy them, I think that most people just make them because they don’t appreciate the huge number of cookies that are out there. Take for example this example above. These cookies are called Spritz Rings. 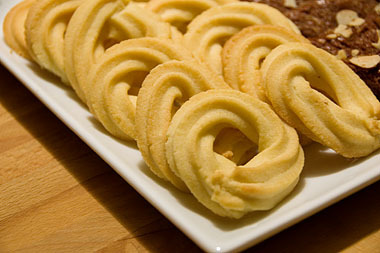 My pastry teacher, a proud Swede, writes that no cookie platter would be complete (in Sweden) without these cookies. 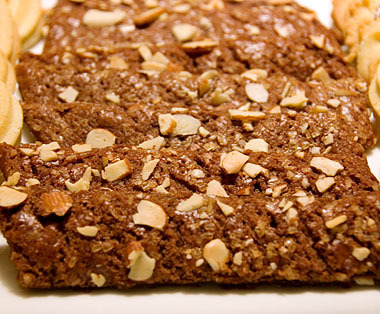 It’s not hard to figure out why, either; these cookies are buttery, crispy, and delicious. Topping it all off, they use a minimal amount of ingredients and are easily piped into any shape you desire. 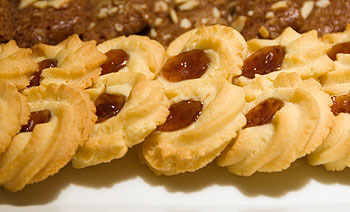 These cookies used the same exact recipe as above but were piped into figure-eight patterns and filled with jam. Same buttery, crunchy goodness, now with more jam! Who doesn’t like cookies and jam? That’s what I thought. These last beauties are called Cocoa Cuts. Everyone should know how to make these cookies. Throw a few ingredients in the mixer, form into a long dowel, flatten with your hand, and cover with sugar and nuts. You actually cut these cookies after they cook. I know it’s a little unusual but once you see how well it works, you’ll be hooked. You could easily bake off pan after pan of these little gems in no time. The next time you have the urge to bake cookies, give the tired old chocolate chip cookie a rest and add a new cookie, maybe one of these, to your repertoire. Could I get the recipe for the spritz rings? This is just wonderfully versatile recipe very much like a butter creme cookie recipe I use in my cookie bouquets. Thanks. Oh, as a swede I’m delighted to see some Swedish cookies 🙂 Great job! Amrita: It’s sort of a butter cookie dough, but a little different. I’ll try and remember to post it here. Brian: Funny, I write this post and see about 4 other posts on my reader with chocolate chip cookies, maybe I should direct them here? brilynn: Indeed. Although these could have used a little bit more jam in the end. Cookies? Good. Jam? Good. Together? Excellent. Totally agree on the chocolate chip cookie. There are a lot of under-rated cookies out there. Those Swedish cookies look great. Oooh! I love the ones with jam in them….Is this a basic butter cookie? Or one with cream cheese or something in the dough?